This knee-jerk response is often closely followed by a rash of questions indicating intense curiosity mixed with a touch of apprehension and perhaps a fair amount of misinformation. This article answers several of the questions most commonly asked by those who haven’t tried scuba yet. You can consider it a primer for the would-be diver, the friend, co-worker or family member who you think might enjoy our sport. By acting as a scuba steward, you might help turn a nondiver into a new diver — and maybe your dive buddy. As active recreational pastimes go, scuba diving is one of the easiest to learn. While you’re gliding around enjoying the underwater sights, you’re engaged in only three basic skills: floating, kicking and breathing. Of course, there’s more to it than that — becoming proficient at using the equipment and developing knowledge of scuba concepts and safety procedures — but if you can breathe through your mouth, chances are you can learn to scuba dive. The necessary skills are not tough for most people to master. During scuba certification class, you’re taught the effects of increased water pressure and safe diving practices. You rehearse equipment-related skills in a controlled water setting until you feel comfortable, as well as practice what to do if things don’t go as planned. The bulky scuba gear worn by many divers may seem intimidating, but learning to use it is straightforward. If you’ve snorkeled, you’re already familiar with the mask, snorkel and fins. The scuba unit consists of an air cylinder containing compressed breathing gas, buoyancy compensator (BC) jacket to help you float on the surface and maintain your desired depth underwater, and a regulator for you to breathe through. The exposure protection keeps you warm when diving in cool-water environments. You don’t need to be a strong swimmer or an athlete to scuba dive, but some degree of comfort in the water certainly helps. Even if you enter scuba training with less than total confidence in your water skills, by the time you receive your first certification card, your comfort level will be greatly increased. Learning to scuba dive is mostly a matter of attitude. If you are motivated to step through the door into an exciting new world, then the experience will prove both energizing and confidence-building. Doesn’t it hurt your ears? This question comes mainly from folks who have snorkeled and tried to dive beneath the surface — free dive. They swim headfirst down to about 6 feet (2 m) and suddenly develop a stabbing pain in their ears, sending them shooting back to the surface. The unknowing assume that they have an ear problem that precludes them from scuba diving. On the contrary, the problem is due to a lack of knowledge about the effects of pressure and is easily prevented. If you fly in a plane without serious ear discomfort, then your ears should not present an impediment to diving. Increasing water pressure pressing inward on your eardrums as you descend, compressing the surface-pressure air within your middle ear, causes the pain. The remedy is to equalize the pressure on both sides of the eardrums by opening the eustachian tubes, which run from the back of your throat to the middle ear. This is done by pinching your nostrils shut, lifting your chin and gently trying to blow out through your nose. Try it now. You should hear a slight crackling sound — the eustachian tubes opening. Some divers can equalize by simply moving their jaw or tongue. It is typically easier to equalize the ears when scuba diving than when doing a headfirst surface dive. The reason is that scuba divers are taught to descend feetfirst (air moves up more readily than down) and to equalize “early and often.” Unless your ears are stuffed by cold or allergy symptoms or you are one of the very few people born with narrow eustachian tubes, ear pain is not an issue. Trained scuba divers know that if they do occasionally have trouble clearing their ears, it’s time to skip diving until the congestion eases. What is there to see down there? A whole new world of incredible sights awaits the scuba diver, no matter what the underwater environment — fresh or salt water; tropical or temperate; ocean, quarry, lake or river. It shouldn’t be hard to envision yourself gliding effortlessly through a crystal-clear tropical ocean, marveling at rainbow-hued fishes flitting about a vibrant coral reef. We’ve all been treated to underwater scenes such as this on TV, in movies or perhaps a friend’s underwater video. You may even have caught a firsthand glimpse when snorkeling in Florida or the Caribbean. But unless you’ve spent time underwater, you can’t appreciate the wealth and diversity of life on a coral reef. Fishes are the most recognizable inhabitants, however, they represent only a fraction of all reef animals. Sponges grow in bizarre shapes, often resembling vases or organ pipes; anemones and feather stars extend scores of tentacles like delicate flowers; soft corals imitate bushes waving in a breeze. Even the rocklike reef-building corals are actually colonies of thousands of individual animals. And that’s not to mention the cryptic crabs, undulating sea snails and spiraled Christmas tree worms. What most nondivers don’t realize is that there is plenty of life in non-tropical environments as well. The temperate waters along both coasts of North America support many times more life than warm seas. The nutrient-rich waters are thick with the microscopic creatures that form the basis of the entire food chain. Kelp forests are nature’s underwater jungle, and the chilly Pacific Northwest is home to the massive Metridium anemone and the gentle giant octopus. While freshwater diving venues don’t support the diversity of life found in the oceans, the fish population can be impressive, especially where they’ve been nurtured. Whether it’s migratory salmon, intrusive bluegill or the elusive paddlefish, there is bound to be something to entertain divers. Also, by concentrating your gaze in a small area, you’ll find a variety of snails, plants and other attention-getters right at the tip of your nose. Living creatures are not the only underwater attractions for divers. Man-made features are also popular. The Great Lakes and the entire East Coast of the United States are known for shipwrecks, many sunk during World War II. Realizing the potential for tourism, more and more communities are cleaning, preparing and sinking wrecks — commercial jets as well as mothballed ships — strictly for the pleasure of scuba divers. And lakes formed by damming rivers often hold the remains of flooded villages and drowned forests. Nondivers often believe that it is dark underwater. Certainly this is not the case in most warm-water areas, where visibility commonly exceeds 100 feet (30 m). Water does absorb and scatter sunlight; reds are the first to disappear, turning underwater scenes to shades of blue, or in areas with extensive suspended particles, to emerald green. Many divers routinely carry lights — both to restore natural colors and to peek under shaded overhangs. Although there are plenty of interesting and unusual sights to hold the attention of scuba divers, some enthusiasts dive for the sheer pleasure of floating weightless in an environment as close to outer space as the majority of us will ever experience. Of the almost 400 species of sharks inhabiting our oceans, only a handful are known to be aggressive toward man; none of these are typically encountered by divers. Despite their position at the top of the ocean’s food chain, sharks’ reaction to a diver’s presence in their domain is commonly one of disinterest. Half of shark attacks are to surfers, whose appearance on the water’s surface approximates that of seals or sea lions, a major food source for some species. The “Jaws” movies were largely responsible for the image of sharks as man-eating killing machines, and the media attention surrounding last year’s shark attacks in U.S. waters unfortunately reinforced that impression. The truth is that only 76 unprovoked shark attacks occurred worldwide in 2001, five of them fatal. Just 11 of the attacks, all nonlethal, involved divers or snorkelers. In other words, your chances of getting injured by a shark while scuba diving are minute. Many scuba divers actually seek out shark encounters. 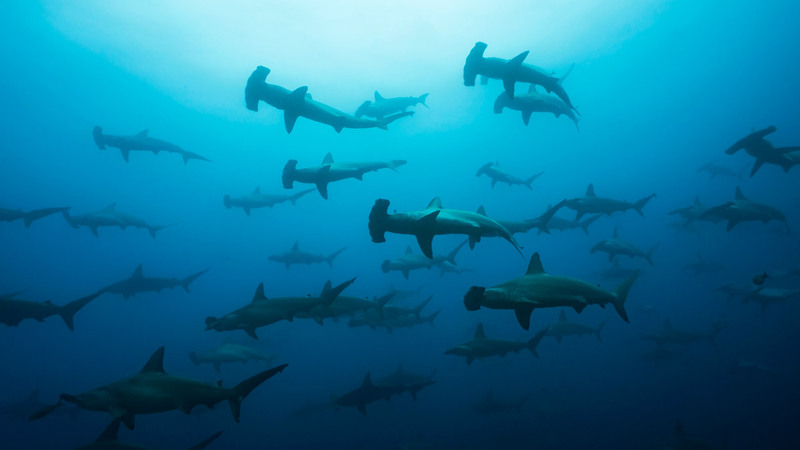 The Galapagos Islands of Ecuador, Cocos Island off Costa Rica and the Flower Garden Banks in the Gulf of Mexico are popular destinations for diving with schooling hammerheads. A few dive operators offer open-ocean encounters with more aggressive shark species in the relatively safe confines of a shark cage. Diving venues around the world routinely engage in shark-feeding dives, in which guides hand-feed reef sharks or anchor giant “chumsicles” — frozen balls of fish — near the bottom, as fascinated divers watch from a respectful distance. 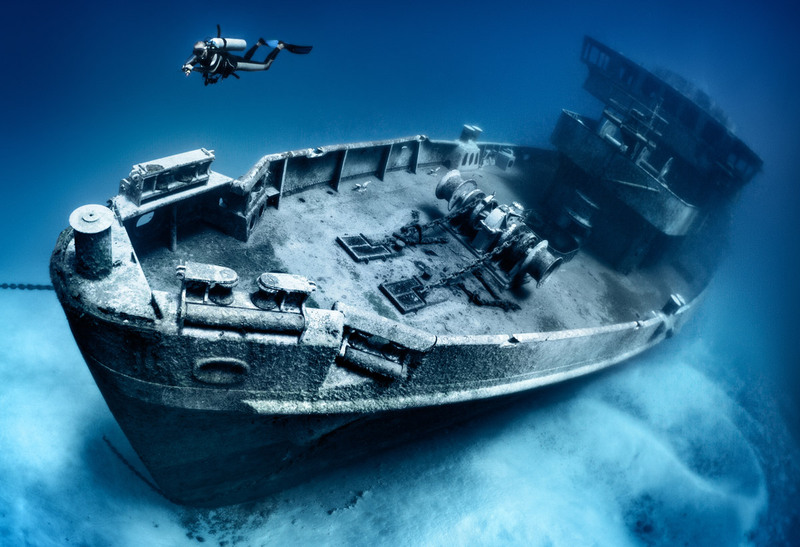 Although the wisdom of such activities has recently been called into question, these thrilling dives have been increasingly popular in places like the Bahamas. No injuries to participants have been reported in several years of shark feeding, and the educational value of observing sharks up close helps spread the truth: Sharks are an indispensable part of the ocean’s natural balance. The fact is that sharks are in far more danger from humans than we are from them. It is estimated that up to 100 million sharks are killed each year as bycatch to commercial fishing activities as well as for disproven medicinal remedies and shark fin soup. Several species are actually in danger of becoming extinct — an eventuality that would have serious, irreversible ecological consequences. Why do you need to wear weights? Believe it or not, the human body is quite buoyant. With your lungs full of air, you’d be hard pressed to sink, especially in salt water. That’s why most people have no trouble snorkeling — when you lie flat on the surface with your head in the water, your weight is easily supported, whether you weigh 100 pounds or 300 (45 kg or 136). Add scuba equipment and you become even more buoyant. Even though scuba tanks will sink when full, divers wear buoyancy compensators (BCs), vests that not only secure the tank to the diver’s back but also contain inflatable air bladders to provide flotation on the surface. Wetsuits are made of neoprene, a type of rubber that contains thousands of tiny air pockets. These air cells provide insulation to prevent heat loss and in addition add considerable buoyancy. The amount of weight worn varies from a couple of pounds (1 kg) to more than 30 pounds (14 kg) depending on a variety of factors. Salt water, for instance, is more buoyant than fresh water, so about 2.5 percent more weight is required. The type of exposure protection worn, specific scuba equipment, dive conditions and an individual’s body composition also affect the optimum amount of weight. Divers regularly re-evaluate the amount and placement of their weighting system. The industry standard depth limit for recreational divers is 130 feet (39 m) at sea level. During the basic scuba certification, students experience depths of 30-60 feet (9-18 m), and a “deep” dive is considered more than 60 feet (18 m). “Going deep” is not an end in itself for scuba enthusiasts. Science has shown that the vast majority of marine species live at depths less than 60 feet (18 m). Within the limits of their training, divers go as deep as necessary to see the points of interest at a particular dive site. That may mean 110 feet (33 m) along a coral-covered wall, 90 feet (27 m) on a wreck or 20 feet (6 m) in a river. Staying shallow holds several advantages. One is that your air lasts longer. The deeper you go, the greater the water pressure. The scuba regulator works by automatically providing the diver air at the same pressure as the surrounding water. Therefore, the air in the cylinder is used faster the deeper the dive. For example, at 100 feet (30 m), air is used four times as fast as at the surface. If it takes a diver an hour to become low on air at or near the surface, all else being equal, it would take the same diver only 15 minutes to deplete his air on a 100-foot dive. Another advantage of remaining shallow is that the diver’s body accumulates less nitrogen in a given amount of time. This allows him to stay down longer without needing to make a mandatory decompression stop. Decompression diving is beyond the scope of standard recreational dive training. Recreational divers primarily breathe filtered air compressed into the scuba cylinder. Nitrogen, which comprises 79 percent of “plain old” air, is not metabolized, but accumulates in the tissues when breathed under increased pressure as you dive. This is what causes decompression sickness, or the bends; when the absorbed nitrogen is released too quickly, it forms bubbles in the tissues. The same percentages as above apply: A diver absorbs nitrogen four times faster at 100 feet than at the surface. There is a definite trade-off between how deep you go and how long you can stay down. Some recreational divers expand their skill range through additional training in technical diving disciplines. These include courses in deep diving and use of mixed breathing gases — gases other than plain old air. Are my kids too young? Am I too old? Scuba diving is a nondiscriminatory activity. Anyone with the physical ability to handle the equipment and the emotional maturity to comprehend the rules and take responsibility for his or her safety and that of his dive buddy, can scuba dive safely and enjoyably. There is no upper age limit on learning scuba. Prospective scuba students are asked to have a standard medical questionnaire completed by a doctor — preferably one knowledgeable in hyperbaric, i.e., pressure-related, medicine. Certain conditions may preclude those of any age from diving, temporarily or permanently, especially conditions associated with lung functions or anything that may impair your ability to perform effectively underwater. As long as you maintain relatively good physical and mental conditioning, it’s never too late to learn scuba. Many divers continue into their 70s and 80s. Minimum age restrictions do apply, although these have recently been lowered by some scuba certification agencies with the development of noncertification programs for children as young as 8 years old. These programs allow enthusiastic kids to get a taste of scuba diving under strict supervision and depths not exceeding about 6 feet (2 m). 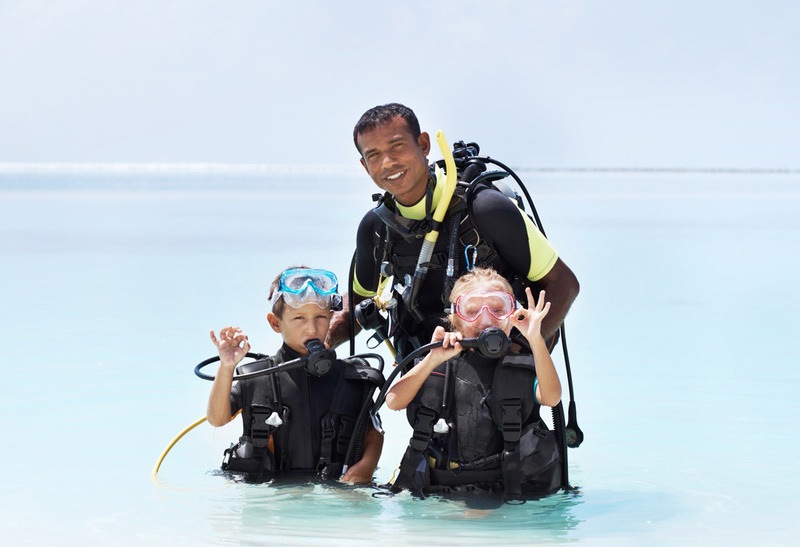 In general, children must be 10-12 years old, depending on the agency, to be certified as “Junior” divers, who may dive only under restricted conditions (i.e., limited depths and supervision by a scuba professional or certified adult diver). 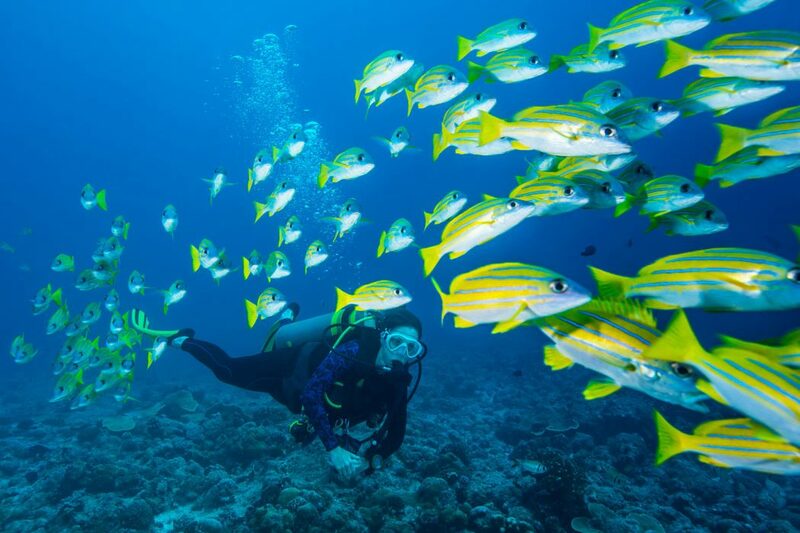 At 15 or 16 years old, students receive the same certification as adult divers. Of course, children mature at varying rates and only parents can decide whether their child is emotionally and physically ready to shoulder the responsibility inherent in scuba diving. Handicapped individuals can also participate in diving activities with the help of specially trained buddies. How do I get certified? How long does it take? All scuba instructors are affiliated with one or more of several scuba training agencies that operate in North America and worldwide; each with its own curriculum designed according to the training philosophy of its governing body. Despite this diversity, the industry has responded to the need for cross-agency consistency by implementing a set of minimum standards for the basic level of scuba certification. Therefore, at least at the entry level, what you are taught is similar, no matter which agency you certify through. Agencies allow their instructors sufficient leeway to incorporate additional material specific to local dive conditions as is necessary to produce competent divers. Local scuba centers are often associated with one or more scuba training agencies to assure their customers maximum flexibility in learning opportunities. The basic scuba certification course, commonly called Open Water Diver, is divided into three sections: academics, confined water and open water. The academics portion develops the knowledge base necessary to understand the principles behind diving rules and procedures. Traditionally, this involved several classroom sessions spread over days or weeks, but with the advent of interactive computer technology, a combination of self-paced lessons and/or amplification and testing by a scuba instructor has allowed academic training to fit just about anyone’s busy schedule. You practice dive procedures and learn to use the equipment in the confined water section, usually consisting of several instructor-led sessions in a pool. The open-water section consists of four or more supervised dives, during which you’ll demonstrate your mastery of scuba skills in an actual dive setting. When you earn your certification card you’ll be qualified to dive in conditions similar to those in which you were trained. Open Water certification can take anywhere from three days to a year to complete, depending on your preference and schedule. Your local dive center may offer a variety of training options, mixing classroom and home-based computer training with pool sessions and local open-water checkout dives. Another option for those in cold-water areas, especially in the winter, is to complete the first two sections and then accompany your dive center on a trip to a warm-water dive destination to complete the open-water portion. Still another possibility, after completing the academic and confined water sections, is to request referral papers, which allow you up to a year to complete the open-water dives with a qualified referral instructor at a resort location. Dive centers want to make scuba certification work for you. Some offer two-weekend “executive” courses, and many resort areas offer a three-day intensive certification for those on vacation. These latter options are most appropriate for those with good water skills and the willingness and ability to assimilate the material quickly. Costs for scuba diving compare favorably with those inherent in other active recreational pursuits. Pricing for Open Water scuba training varies widely according to the local market, but should include the cost of training materials. Use of scuba equipment for the duration of the course, other than mask, snorkel and fins, which are considered personal and supplied by the individual, may also be included. Once certified, scuba diving can cost as little as renting a scuba tank or having your own filled — an expense characteristically less than $10 per tank — and traveling to an area lake, quarry or river, or diving from a public beach entry. Compare this with the price of lift tickets at ski resorts, or a round of golf. One thing that these activities have in common is the need for equipment. Purchasing a set of scuba gear — BC, regulator, exposure protection — is no more expensive than getting started in skiing or golf. For the infrequent diver, renting equipment may be an attractive alternative. Of course, as in all worthwhile pursuits, you may choose to expand your scuba “must have” list with items such as a dive computer, underwater camera and other accessories. Similarly, scuba vacations are available to suit every budget, from weekends in bunkhouse accommodations with shore diving, to luxury dive resorts in exotic locations. The price of airfare is a major factor in considering vacations to any faraway destination, whether it’s for sightseeing or diving, or a combination of both. Live-aboard dive boats offer the opportunity to visit remote dive destinations and do as much diving as you desire for an all-inclusive price. Do I need to renew my certification periodically? Recreational scuba certifications do not have to be renewed periodically; they are good for life. A certification card is required in order to rent scuba tanks or have tanks filled, and also when renting gear or booking space on a dive boat. However, many dive operators also require proof that the individual has been diving within the past six months or a year. A logbook showing completed dives within the required time frame is usually adequate proof. Lacking such documentation, the operator may require a checkout dive with a scuba instructor to verify that your skills are sufficiently current to dive safely without supervision. Like any skill, scuba training will become rusty if not used for long periods. It is wise to take a refresher course, offered by all dive stores, after a hiatus from diving. Even after an interval of several months or when using different equipment, it is highly recommended to schedule time in a pool to practice basic scuba skills and re-familiarize yourself with the equipment. The best way to maintain scuba skills is to dive regularly and continue training. Scuba proficiency is a continuum — you can’t learn it all in one basic course. Dive centers offer a whole range of courses to improve your skills and comfort level underwater, as well as specialty courses to expand your horizons. You can learn additional navigation techniques, how to identify the fantastic creatures you’ll see, the excitement of diving at night, the intricacies of capturing all of it in still photos or video, and much more. If you are interested in assisting other divers or teaching scuba yourself, a variety of leadership courses will turn you into a scuba professional. The possibilities for a lifetime of enjoyable diving are practically endless. You just have to get started.